Julia’s Fairies is a wonderful place on the Net, and I am proud to be invited to be the judge for this tourney. It was a very strong one! I expected a broad variety of styles and artistic levels, and I was not disappointed. There were 80 entries by 35 composers. I counted 38 different fairy conditions and 23 different fairy pieces (or families), but you may come to a different result as there is more than one way to deal with closely related conditions and pieces. (And imitators are somewhere between fairy pieces and fairy conditions…) The variety of stipulations was far less, however: helpplay dominated completely, and direct play occurred only too rarely – but was much appreciated by the judge when it did occur. Thematically, the field covered all the way from complex constructions where the composer must have known at the outset what he was aiming for, to light positions that seem to have been found by experimenting freely with the computer and keeping whatever gems were found. The chances of quick publication at the web site, and probably also the chances of quick responses from readers, seem to attract good compositions. So the quality of the entries was quite high, more than enough to produce a good award. In fact, at least half of the entries were serious candidates for a place in the award, so I had to pick those entries that stood out most clearly in my mind and leave out quite a few other compositions. I chose not to divide the tourney into several sections, but instead to give more prizes and HM’s than is normally the case. I don’t think I have ever felt the need to give 8 prizes in a tourney before! The comments on the problems were often very helpful. Some comments contained versions, and some of those later led to the publication of a revised version. Some versions in the comments were never officially published, and those do not take part in the tourney. Among them, there were a few that would have been candidates for the award. The best of them (a version by Packa of 593 Prentos & Manolas) would certainly have been honoured here, but an even more improved version has appeared elsewhere so the composition is not lost. 670 (Mlynka) The rules of Pressburg (Supertransmuting) kings have long been imprecise, but this year’s discussions have led to the conclusion that a check on a Pressburg king must always be parried by the king himself (who then loses his royal status). This implies that part a) of this problem is OK (Black cannot play 4…Rg7), but part d) has no solution (Black cannot play 4…Rf3). Otherwise, the problem is quite interesting: it is normally impossible to mate a Pressburg king or to force him to make a particular move, as it doesn’t help to guard his flight squares, but imitators can limit his move possibilities so that no move or just a single move is legal. Perhaps it would be worth it to keep parts a)-c) as a sound 3/4 AUW? All other entries are sound as far as I know, so there remained 78 problems to judge. The animated diagrams were of great help in my work – for most problems, I did not have to pull out my chess board. Animation is included in this award, too. You can follow the links to the original publications in order to find the definitions of all fairy elements used. Dedicated to Julia in her birthday! The cyclic double pin is a well-known extension of the orthodox halfpin: if three pieces are placed between their own K and an opposing lion, and one of them moves away, the other two are pinned. But the effect probably has never been shown as harmoniously as here, with three moves to and fro by the active piece in each solution: one to provide a hurdle for the first white move, another to provide a hurdle for the white lion on h1, and finally the mating move to c4. This mating move is forced by a battery check, with the arrival square being the one on the fifth row that the active black piece guards when some other piece moves to c4. The construction can be described as flawless: only Pa3 and Pe3 are not actively involved in the thematic play or in the mating nets. Pa3 stops a check from Ra5 without destroying the pure mates, and Pe3 is a necessary hurdle for the white lion in one solution. The use of kangaroo-lions instead of normal lions is not thematically motivated, but solves some technical problems very neatly. One of them is that c4 must be guarded by some black piece that cannot itself go there, and the constantly pinned Sb2 fits this requirement. Having a kangaroo-lion also on h1 requires another static unit on the first row, and luckily a bSd1 can be used and serves the additional purpose of guarding c3. The hit of the tourney was the imitator with 18 entries, no doubt related to the fact that it was stipulated in our Christmas tourney of the year. But the imitator has the unfortunate property that each move will change almost everything in the position, by turning moves by other pieces legal or illegal, so that the play becomes more obscure than logical. Often, one even has to think hard to determine whether a certain position is a mate or not. And I like play with clear logic behind the moves! So most of these problems are outside the award. Of course, a good composer can devise a clear strategy with imitators, or use them to produce memorable settings of other themes. This is a superb example of the former; in fact, it is one of the best imitator problems I have ever seen! There seems to be a set-mate by 1…Kc2 (Ib2,g8)+, but Black defends by 2.e6-e7(Ib1,g7)! with no check because of Ib1. So Black has to play a 23-move (!) foreplan with the sole effect of replacing Pe7 with a Se7, which has no imitator-legal move at all. The imitators prohibit Pe7 from walking straight down to a S promotion, so like an elevator the bK has to ascend as the bP descends to e1 for the S promotion. The bK path is unique: the left edge prevents him from stepping on to the c file, and the wK stops K moves to the e file which would make the next bP move illegal. After the promotion, the mechanism reverses and the bS ascends in order to allow the bK to descend back to d1 (this is the only reason the bS has to return to e7). Again, the edge and the wK force the bK to walk in a straight line – but now in a different way! The board edges also force the bS to walk a unique zig-zag path. Finally, we must consider the choice of promotion. Nothing is gained by a promotion to bQ or bR, as Black can still defend with Q(R)e7-e6. But a bishop promotion is possible, and it can in fact be brought back to e7 (bB zigzagging e1-f2-e3-f4 etc, and bK echoing with d7-e6-d5-e4 etc). But a bBe7 can defend by 24…Kc2 (Ib2,g8)+ 25.Bd6 (Ia1,f7)! or Bf6! 1.Ke7! I--! 2.Ke8! e7 3.Kd7 Rd5 4.Kc6 Qa3! 5.Kb6 Qh3 6.Ka5! Qc8 7.Ka6! Rd7 8.Kb5 I--! 9.Kc5! I--! 10.Kd5 h8R 11.Ke6 Rg8! 12.Kf7 Re8 13.Kxe8 e6 ==. The invisibles are strange creatures, being everywhere they legally can be – until their nature and whereabouts are revealed by the play, somewhat like the behavior of particles in quantum physics. Here, the aim is to play a sequence of 13 moves, such that the end position must be a double stalemate, no matter where the 8 invisibles are in the diagram position and no matter which moves they make when no visible man moves. Unsurprisingly, this is only possible if all 8 invisibles are revealed in the solution, so that the final position is completely known. The solution requires a long trip by the bK via a5 and a6, so that white Ps can be revealed as necessary shields on a7-b7-c7 – to function as blocks in the double stalemate. But this is only a small part of the solution, which is full of subtleties such as * the initial switchback Ke8-e7-e8, * three invisible moves which are later proven to have been d7-d8B and d4-d5-d6, * a strange manoeuvre Qa6-a3-h3-c8 where the alternative route via g4 is only ruled out by an invisible P still on d4, * and finally a totally unexpected orthodox tempo-move Rg8! I think the revelation of three invisible moves is an especially remarkable feature here. Six very similar thematic variations: one of the two thematic wP’s moves to provide the hurdle for an equihopper mate, the variations forming two 3/4 albinos. In three cases, the variation is introduced by Black providing a hurdle for the mating move itself. That ideally should have been the case in all four variations where the wP’s don’t capture (the variations with wP capture are naturally different). This lack of homogeneity is compensated for by two features. First, we have wonderful cooperation between PAg6 and Sh8: any move by PAg6 parries the threat by allowing Sg6+ , which leads to three variations, and then Sh8 itself provides the fourth variation. Second, there is an excellent quiet threat using the thematical EQg8, linked to an equally excellent by-variation1…VAa7: the threat is not 2.Ke8? VAxe5! (2.EQc8+ VA~! ); 1…VAa7 gives up VAxe5 in exchange for 2.Kf8? VAc5+! This pair of lines forms just a side theme here, but they are by themselves good enough for a decent problem by a less ambitious composer. In view of the rich content, the economy is completely satisfactory: there is just the one thematical equihopper, and a Chinese pieces or a lion is clearly needed to make the wP moves checking; the other three Chinese pieces are pieces are well used as hurdles and/or guards. One might ask whether two complete albinos can be shown in the same fashion. But that would imply two thematic EQ mates from each of c4 and e4, so the idea is probably not worthwhile. This problem clearly demonstrates the value of the Comments function on the site, a feature that printed magazines can’t have in the same way. The original version 612 would have had a low place in the award; the version that was reached through the discussions is superior to the original in every possible respect, and thereby rises to a place near the top. In the end result, we have an AUW where each promotee makes a colour-changing trek to a different mating-square. The uniqueness of the paths is very economically achieved – the position of the wK is crucial – but best of all is the first white move, that provides a black piece to be captured on the last move, avoiding a fatal colour-change at that moment. Note also that all three white officers are used in every solution. To get three four-move solutions with an AUW+2 (three Q promotions) without twinning in such a light position is remarkable indeed. Some move repetitions (g6-g7, c4-c6) are unavoidable and excusable. There are some subtleties in the play: White plays Pc4-c3 via c2 to allow Black to play Pc2, and Black returns the favour by playing Pc5-c6 via c7 to allow White to play Pc7; the R promotion is necessary in the first solution because c1Q would make 4.Kd8 illegal; and g8nS is necessary to guard e5+e7 as a nR on e3 or e4 would be able to capture the mating nQc8 by ghostly magic. I must mention that other commentators were more disturbed by the lack of black economy than I am. 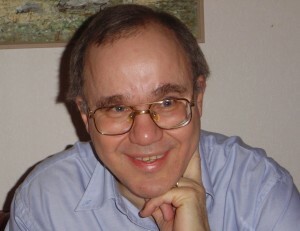 In particular, Petko Petkov reported that better settings exist with twinning. It is quite possible that I would also prefer one of those settings, or maybe not – I can only judge the position that has been published. One of the black Andernach (hurdle colour changing) lions must turn Rd7+Bc7 white via c8, while the white Andernach lion turns Sd6 white for a mate on c4 or f5. The mates require that Bf7 or Rb5 is shut off. In the solutions, this determines the arrival square of the AL in B2: c5 or e6, respectively. But the black interference has the unwanted side effect of allowing the black AL to turn the mating S white by ALg5(bSf5) or ALb3(bSc4). This is turns determines the arrival square of the AL in W1: h6 or a3, turning those defences into illegal self-checks by a kind of anti-pin effect (using the normal lion power, not the hurdle colour changing one). The idea has the inherent weakness that most of the events of the first three halfmoves are the same in both solutions: the same three pieces are made white (but there are different and intelligent arrival effects in W1 and B2). The need for Pa2+Ph5 is a very small weakness of the matrix. The matrix seems to also have the weakness that one of the thematic black Andernach lions is idle each time. We are indebted to Nikola Predrag for pointing out that this is not really the case: the immobile AL has what I consider to be a thematic function by stopping an inherent cook where the white AL, instead of the black AL, shuts off Rb5/Bf7. Black can then choose the arrival square in B2 so as not to guard the mating square (by sacrificing on that square) – but the immobile AL still guards that square and can turn the “mating” S black! This motif greatly enhances the problem. This is one of the most fairy problems in the award! The mates depend on what happens when two fairy conditions are combined, and the result is not entirely clear from the definitions of those conditions – so we have to consider the “essence” of the conditions and use that to make a reasonable interpretation of the results of the combination. No wonder, different solving programs often make different interpretations – so this problem can only be solved with WinChloe, not with Popeye. The question here is what really happens in Back-to-Back. Does a white piece in a BTB situation temporarily transform into the piece type of the black member of the pair, or does it keep its own piece type while temporarily changing its power of movement? In “orthodox” BTB this subtlety makes no difference, but in combination with Madrasi it really does. This problem (like WinChloe) follows the second interpretation, which means that Bh5# works like this: wBb5+bRh4 are in a BTB position, so Bh5 moves like a R even though it still is a bishop. So Bh5 observes Bf5 by its R power, and Madrasi-paralyses it because it really is a bishop like Bf5. The bK is in check from Bh5 (moving like a R), and is mated as bRh4 is Madrasi-paralysed by wRb4 (again, because Rh4 still is a R even though it temporarily moves like a B) so Rh4 cannot cancel the check by just moving away. The second solution works the same way, with an additional detail: wRb2/bBb1 are in a BTB position, so wRb2 moves like a B, checking the bK and also paralyzing bRa1 by observing it and being of the same piece type; bBb1 cannot cancel the check by moving away as it is paralysed by wBc2; and the wB guards h7 because it is not paralysed by bBb1 which moves like a R. This last effect has no counterpart in the first solution – a very slight imbalance in the problem. One might consider bPh2 to be a weakness, as it is obviously just a cookstopper. But I don’t think so: the P is an excellent technical device, stopping one type of cook by a Madrasi effect (orthodox mates by Rh3# fail to h1R) and another by a BTB effect (1.Rh4 Rh3? 2.Bf5 Bh5+ 3.R~! as wRh3 moves like a P and does not observe Rh4). The only real weakness in the problem is the fact that 2.Bf5! and 2.Ra1! are not played just to stop the bB/R from paralyzing the mating piece by 3.Bg6/Ra2!, which would have been wonderful, but also to simply unguard the mating line. Circle SneK is a promising new condition: its circle of promotions make the rule easy to remember (whereas I always have difficulty remembering the exact definition of ordinary SneK), and the possibilities for interesting strategies seem great. Here, the piece on b3 must be promoted to form a mating battery – so with a Rb3, White must capture a Q, and with a Sb3, White must capture a B; this determines the promotion on a1. But the really interesting part is the handling of f5: White must guard the square, which can only be done from c8, but without guarding e6 and thereby stopping the mate. The solution to the riddle is to have the piece on c8 promote on Black’s mating move, so f5 (and e6) are guarded before the mating move but not after it! So with a wR being captured in the mating move, White promotes to a Bc8 which Black then promotes to a R, and with a wS being captured in the mating move, White promotes to a Q which Black then promotes to a S. This motif might be useful in other probems. The twinning change is essential regarding the piece on b3, but in principle, the changes on d1 and d5 might have been avoided in a different matrix. But on the other hand, this unusual twinning is a neat way to make the whole play work. A strongly thematic problem in an unusual form: the theme is shown with Black in one solution, and with White in the other. The idea is based on the well-known Isardam configuration with a white and a black line-piece of the same type on opposite sides of a king: the king is not in check, but can only move on the line, as both a capture of the K and a move off the line would produce an Isardam- illegal observation. But with Einstein added as an extra condition, the K is usually in check (the promotion after a hypothetical capture of the K avoids the illegal observation) and is usually also mated. In the first solution, this happens to the black K on the fourth move, so that Black’s only reply to the check is to capture the checking piece – with a promotion that gives a normal mate to the white K. In the second solution, it happens to the white K on the third move – but White has a specific response demoting the wQ to produce a wR observing the wK, so that the capture of the wK will be illegal in Einstein too. But his move is a check, which Black can only answer by capturing the checking R – mating the wK! The construction is almost faultless. All remaining officers are active in both endings. I don’t think that the capture 1.Kxa2 in one solution is a flaw. White wants to be mated but starts by capturing one of Black’s few pieces. A nice point without strategical significance is the fact that both kings seem to be in check in the diagram, but none of them is, due to the combination of conditions. The only detail to be regretted is the need for Pe4, stopping the dual 2…Qe4=R instead of Qc6=R. But it is a very small detail. This shows the same idea as the prize-winner 673 by the same composer, but in a sufficiently different manner to be considered an independent problem. As in 673, the imitators force the bK to ascend to allow the bP to descend to promotion, and then the promoted P has to ascend (this time in a straight line) to allow the bK to descend again – but not for that reason alone: the Q that results from the promotion also has an active role to play in the final phase. After 20 moves, we are back in the diagram position but with Pf6 turned into Qf6. 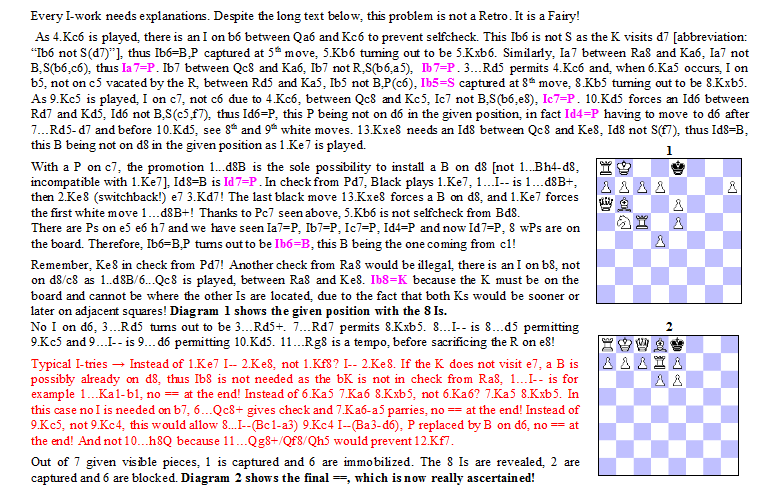 This allows a tricky ending, which is not necessarily an advantage (the quick mate in 673 is clearer), but it ends with another wonderful point that is not present in 673: any normal promotion on d8 will block that square so that Rb1 doesn’t even check Kd1 – only an imitator doesn’t block the square! The expert in SAT selfmates with royal grasshoppers (quite a specialized field!) has come up with a variation on his normal formula: two long parry-series-mover solutions instead of the usual collection of intricate short variations with black counterplay. The result is very good and comparatively easy to understand. I am amused by the way the white G + N have to walk along the walls of their 8×8 room in order to avoid unwanted checks (in addition to the two intentional parry-provoking checks) or self-checks, i.e. not to give any royal G a flight. I also appreciate the change of function of G/N in the two final positions: one acts as a hurdle for the black royal G, and the other makes its move SAT-legal by guarding the square behind that hurdle. In both solutions, the result is that the white royal G gets a flight and cannot change that situation – so White is mated. This is a remarkable event: Harris took the position of Tritten’s 649 (to be found later in the award) and played around with it, adding the white maximummer condition, changing one or two pieces – and ended up with an entirely different gem! The problem is quite homogenous (an AUW including imitator, with excellent twinning) and clearly superior to the original. It is hard to mate in a white maxi, as any attempt by Black to escape mate must allow White to capture the K with a maxi move. An imitator can be of some help as it can prohibit some black moves, but on the other hand it increases Black’s chances of giving White some longer, non-K-capturing, move just by changing the position of the imitator. In a), Black promotes to a S (which never moves again!) in order to check the wK so that Bf3 becomes a maxi move (neatly using bKc6). In b), Black promotes to a B in order to block a4 without guarding d3 (therefore not Q). In c), Black promotes to a R mainly to check on d2 so that Rb8, rather than Rf2 etc, becomes a maxi move. In d), Black promotes to a Q (rather than a B) so that Bc6-h1?? will be an illegal self-check from Qc3 and Rh7 will be a maxi move. In e), Black promotes to an I for two reasons: to make Bg4 a maxi move, and to make Ka4 legal (because Rxa4 is not). With its two solutions ending in chameleon echo mates (without repeated play), this is clearly superior to its inspiration 620 (Harris) – despite using twice as much material… It is actually surprising that two such different but related solutions can arise from a simple position like this. The problem demonstrates the interesting fact that in Phantom Chess, a neutral piece can check a neutral king without giving self-check (which is “normally” only possible with pawns), because neutrals capture differently for White and for Black. Thematically, we don’t have the expected AUW, but instead an interesting cyclic change of Q/B/S promotions by the three pawns (with the nice point that 1.a1=nQ?? is illegal because of self-check). There is a small flaw in that one line ends in a model mate but the other one has g7 double guarded. Two black grid-specific hideaways in each of the three solutions. It is a fine feature to have the W1 moves, unrelated to the main theme, unified by being played by the same piece with the same length in three directions (which I think may very well be called “forming 3/4 of a wR cross”). I assume the composer regrets the wPc2, which stops a cook with Ke3-d3. A more serious flaw is the fact that the play makes a rather mechanical impression: the same thing happens in all solutions, with no changed functions at all. * in b), 2.Bg3! (not Be5?) is played so that Black cannot defend 3.Qd3+ with 3…Qh3! setting up another potential observation between the two queens and thus immobilizing Bf3. Both solutions in this AUW are a bit unusual, but they are not related in any way except by the promotions. One line ends with a mate by a single neutral (the Q) which is pinned from a distance by a neutral R; the play of the wK to reach d6 (not d5) is intelligent. The other line has a strange nS promotion motivated only by line-opening; the promotion itself is aimless. I think the neutral (rather than black) Ph7 is fully motivated, both by making the material more unified and by the extra AntiCirce effect 4.Kxh7>e8?? in the first line. AUW with specific mates by neutrals, ideal economy and excellent twinning. I like it that neither the nQ nor the nR can escape from the mating position, and I also like the non-reversible mating move by the nS. An AUW with mixed but (of course) original motifs. Part a) ends in a triple check, where the two visible checks are actually unnecessary for the mate, but the invisible check from f8 is decisive. (So why does Black play nRa7, you ask? Just to guard d7+f7!) Part b) has only an invisible check from d8, very neatly prepared by a promotion to block the square d1. A bishop promotion would guard d7 from c8, so only a S promotion is possible (which at the same time changes the bK’s route to d7 from the set e7 to the actual e8). The point of the problem is partly in the unity of the play, with the roses dancing around the royal queen while taking care to always stay in touch (as the composer puts it), but partly in the total contrast between the methods employed in the two solutions. The first solution is just what you would expect: the roses’ dancing serves the purpose of eliminating the observers Sg3, Pd5 and Pf5 so that the royal Q is rendered powerless and easily killed (I am reminded of bullfighting here) – as long as we avoid the trap eROf5+? Sxd8>b8! – But the second solution is shockingly different: a cage is built around the rQ so that it is unable to escape although fully active with all three observers alive (I don’t think this ever happens in bullfighting). The two black knights seem to have no function is he second solution, which is a tolerable weakness. It takes great inventiveness to have the idea of combining these three conditions to produce a double AUW (a shifted Babson) with only three pieces. Madrasi is well known to make similar themes possible and almost easy. The principle is the same in all solutions: Black promotes to some piece; White promotes to the one immediately before it in the Circle SneK chain; Black goes to a square where he is observed by the white piece but also observes his own K; White captures. The result is that KoBul Kings transforms the bK to the type of the black promote, and Circle SneK Adverse transforms the white piece to the same type, and we have the required double stalemate. It is a good thing that the composer managed all four promotions (on both sides) with only one twinning change, and one that doesn’t affect the thematical pawns. I am very amused by the yo-yo play of the black rose-locust back and forth over the same white rose, especially in moves 1-5 (where the yo-yo swings get progressively wider) but again in moves 7-8, 9-10 and 12-13. This effect is reminiscent of 599 (Luce after Feather) elsewhere in the award, which also uses a combination of PWC and locust. The combination seems to invite this kind of effect. The Ph2 is an irritating blemish, although clearly necessary against the dual 13… ROh2#. Without it, the placing would have been higher. White must transform his chameleon Q>S>B to mate on one of the black king’s diagonals. The trouble is that to end up with a white-squared bishop, White must play the S from a black square – and none of the possible mating squares can be reached by a S from any of the four black squares that the wcQ can access. So we have to use a BTB trick: put the S on a white square, but a black piece under it so that it can move to another white square. This trick alone would hardly be enough to get the problem into the award. But there are tries in both cases, where the wcB appears on the mating diagonal as intended, but it is not mate, as Black is able to use the BTB trick once again to temporarily transform the wcB into a S or R. Unfortunately these tries are not quite analogous (one is just a dual avoidance effect in the mate, the other is a full try from the first move on), so the thematic effect is weakened and the distinction can only be a commendation. To have a stalemate with only kings and neutrals is almost paradoxical (but there are a few such positions without an extra condition). With the Annan condition, it can be done very economically as we see. The pair of stalemates is very harmonious. In both cases, the two surviving neutrals have officers’ powers for White, guarding the flights of the bK. But for Black, the same neutrals have only pawns’ powers, leaving one of them blocked and the other with only one move – which is a self-check as it is still an officer. A curious detail is that White seems to be in check in both cases, but the checking power is only there for White (perhaps the composer put the wK on a5 deliberately for this effect?). – The play leading up to the stalemates is efficient but nothing to write home about. In contrast with some other imitator problems in the award, it is almost impossible to see any logic in the play: any deviation from the author’s solutions will change the position of both imitators, and that will change everything. It must be very hard for a human to solve the problem, as the mating positions are also hard to visualize – the only thing you can say is that the mating moves will be played by the wK so as not to be reversible. But the problem has its strong points too, that earn it a place in the award: first and foremost the AUW, and secondly, the set-play/solution form which is unusual nowadays but adds interest: why can’t Black start with a waiting move? The mate in the set-play is also interesting by being given by a neutral (only the imitators stop it from escaping). In this mate, nSg1 does not guard e2, but only serves to block Ih1. In the solution, the mate is – less surprisingly – given by the white K, and the nQ+B guard flight-squares from a distance. The central motif is taken from a problem by Chris Feather, but this setting is independent and in my view even better than the original. The idea lies in a confusing but impressive sequence of repeated captures of a black bishop by a white locust, almost all on a single diagonal (why are so many captures necessary to bring the pieces to the right positions?). CJF has a white minimal, but at the price of two passive, incarcerated black officers. CJF also has interesting switchback play by the bK, whereas SL has a completely unexpected bK walk to the unlikely mating square b6 (!). In both problems, the bK walk is unique only because of the influence of the locust. As a Zilahi, the problem is unharmonious: the wR is sacrificed actively (after a move) and the wB passively. The sacrifice is really motivated only by bringing the imitator to the necessary square h3 in the end, and not by some more strategic effect. But the real point of the problem is something else: both promotees never move again, so the correct choice of promotion is interesting. A rook (or a queen) would in both lines be able to cancel the final check by moving the imitator to a suitable square from which the planned capture of the bK can’t be imitated. Knight promotions are impossible for “orthodox” reasons (attack on the wK), so bishop promotions are necessary. The composer beside the Zilahi also mentions “model mates”. I agree, even though d3 in one mate and b3 in the other seem to be doubly guarded. The imitator makes bK moves to those squares illegal, and it doesn’t matter whether squares that the K cannot reach (under the current rules of play) are blocked or guarded singly or doubly – or not at all. It is nice to see a reflexmate among all of the help-play problems, even though most of the play here has help character as Black usually has no choice of move. The two variations end in nice mates, especially exd1=EA with mate over the incarcerated Bh1. But I am not as impressed as commentator JL with the problem. Firstly, I don’t want to speak about two changes between try and solution: that the wB has to travel to d7 via c6 from f3, but via b5 from f1, is trivial and does not constitute real changed play. The other changed variation is fine, so we have at least one convincing change – but the refutation of the try is crude (the wB puts itself en prise, and the refutation is to capture it). Secondly, and more importantly, LOa1 is passive in one variation and EAb2 is passive in the other (it just shields the bK from check). So we really have one eagle variation and one locust variation, causing the problem as a whole to make a disconnected impression. An imitator problem which is based on a clear idea, with mates that can certainly be found by a human solver. The idea is that the wK play leads the imitator into a corner, from which there is only one way out – unfortunately for Black in the direction from which the neutral Q is attacking the bK, so the nQ can’t leave the mating line! Note also the good try in a): 1…Kf7 (Ig4) seems to be possible too, the imitator will end up on h8 anyway – but then 2.nQh6 (Ig7) ?? is a self-check because Kc1 is attacked one half-move too early! The same is not true in the real solution because of Pc4. I would have liked to see a similar try in part b), but I don’t think there is one. It is a pity that the wK has to be moved so far in the twin, but this seems unavoidable when the wK must reach such distant squares as g8 and g2. A wonderful geometrical concept: all four N’s guard one white and one black flight-square; after a block on a black flight, the corresponding nightrider can mate while keeping the guard of the white flight – but potentially with a choice of two mates. It turns out that a black Ra1 can block any of the four black flights on a unique path (no surprise) and then in each case stops one of the potential mates (a mild surprise) so there are four correct solutions. But further, it turns out that a black zebu c8 can also block those same four flights on a unique path (a mild surprise again) and then in each case stops the other potential mate (this is a shock!) so we get four changed mates. The impression is much less symmetrical than could have been expected. The bad news which has cost the problem a higher distinction is, of course, the dreadful “twinning” with three or four changes in the position. I would definitely have preferred to spend another pawn to get an almost normal twin: add a wPd2 and make Pb5 white, and let the twin be “replace bRa1 with a bZEc8”. This shows a pointed way of forcing the double step of a P (rather than a single step) before a capture en passant: the imitator will end up on different squares in the two cases! I don’t want to waste more time on the discussion about what really happens in an en-passant situation, I just want to mention that I find the interpretation in this problem most natural. The en passant + imitator effect alone would be too little for a good problem, so the composer built in an excelsior, a castling and a P promotion too – forming an extended Valladao. This “theme” is an arbitrary collection of heterogenous elements and not in itself really interesting; but this problem makes a homogenous impression anyway. I especially like the economical s#1 at the end. Note that 5.exf8=Q+? is wrong as White can defend with 6.Qc5 (Ie1)! Speaking of the end: if Black plays 2…e6 (Ie3), the imitator will be on h6 rather than h5 after 5.exf8=R, and then Black will not even be in check and doesn’t have to mate White. I also had 591 (Turevski), 592 (Kochulov, unfortunately with a flight-taking key), 642 (Balasubrahmanian), and 659 (Agostini) on my short-list. But 15 commendations must suffice even in this strong tourney. Congratulations Kjell for the quality of your comments which helps to apreciate all these problems. For me it is much more important than the place of one problem or another. Thanks to Kjell Widlert for this award and the very interesting comments. Congrats to all the winners especially to the master Petkov winning yet another first prize ! Really well thought out award. In regard to the 8th HM, its composer (Geoff Foster) is from Canberra, Australia, not South Africa. But of course, Australia! Sorry, my mistake, thanks! Incidentally, Grandmaster Petkov seems to be selecting some of his best works for Julia’s birthday. See No.895 of this year too! No.895 (http://juliasfairies.com/problems/jf-2015-ii/no-895/). All of these figured in the final award!